The publishing times, they are a-changin’. Newspapers and radio shows alike are making a scramble for new ways to get themselves in the hands of their content consumers. This American Life brought to you by Public Radio Exchange is a great example of new media delivery done right. 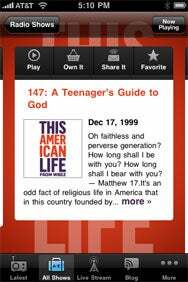 From the Vaults: This American Life gives you access to every episode ever recorded of the public radio program. This American Life, a weekly radio program that airs on public radio, has been making a supreme effort to get all of its episodes available in an easy-to-digest format online, and this $3 app is the icing on the cake. It enables you to access every single episode of This American Life ever recorded, all the way back to the first show in 1995. That makes for 400 shows available for streaming at any time through a very easy-to-use interface, organized by the air date with a short synopsis of each episode. If you need to stop listening for any reason, the app will save your place in the episode, which you can return to at any time. If you like to tune in live to each show, the app includes a countdown to the next episode, an optional push notification feature letting you know when the show is about to start, and the preview information for the next episode. On top of all this, you can also drop an e-mail to This American Life, find your local public radio station, designate favorite episodes, read the show’s blog, hear bonus episodes, share links to shows via Twitter, Facebook and e-mail, and buy episodes on iTunes—all from within the application. This truly is an example of an application that sets the bar high for other media outlets. If you’re a fan of This American Life in any capacity, this well designed and implemented app is well worth the money.